With a plethora of home pregnancy test brands available, it may be difficult to determine which will provide accurate results in an easy to read format. There are a number of popular pregnancy test brands that can help determine whether you are pregnant. All home pregnancy tests detect the presence of human chorionic gonadotropin (hCG) in urine. HCG is a hormone the placenta begins producing upon implantation. While hCG levels vary in pregnant women, they increase as a pregnancy progresses. The American Pregnancy Association states hCG levels double every 48 to 72 hours in 85 percent of normal pregnancies. According to the Mayo Clinic, home pregnancy tests are reliable provided you use them according to package instructions one week after you have missed your period. This is when hCG has reached a level that it can be reliably detected in a urine test. Remove the cap that covers the absorbent end of the test stick. Urinate on the absorbent end of the test stick for five seconds. Alternatively, you can urinate into a clean, dry cup and then dip the absorbent end of the stick in the urine for 20 seconds. Replace the cap and place on the counter with the indicator windows face up. Read the test in the recommended amount of time. Don't wait longer than 10 minutes to read. If you wait longer than 10 minutes, you will need to re-test. A missing line in the control window of non-digital tests indicates the test is invalid. You will need to re-test. The test you use is a personal choice. Many brands are available. First Response offers a variety of pregnancy test options, including Consumer Reports' choice as the most reliable and sensitive test, First Response Early Result Pregnancy Test. First response pregnancy tests all work in essentially the same way. The manufacturer states you do not need first morning urine. Results will appear in one to three minutes depending on the test. First Response Early Result Pregnancy Test detects pregnancy in its earliest stages. The company advertises that this test may be able to detect pregnancy as early as six days before your missed period. It detects hCG concentrations starting at 6.5 mIU/ml, which is a level likely to occur soon after implantation. Read the results in three minutes. A positive result shows as two pink lines in the results window. Even if the second pink line is very faint, it is considered a positive result. A negative result shows as one pink line. First Response Rapid Results Pregnancy Test is designed to provide results in one minute. The company advertises you can test as soon as the first day of your missed period. Read the test result at one minute. A positive result shows as two pink lines in the results window. Even a very faint second pink line is considered a positive result. A negative result shows as one pink line. First Response Gold Digital Pregnancy Test is designed to be easy to read. The indicator provides a "Yes +" for positive results and a "No -" for negative results. The company advertises you can test as early as four days before your period start date. The test activates as soon as you open the wrapper, so do not open the test wrapper until you are ready to begin. The test window has a clock that blinks to tell you the test is working. Results will appear in about three minutes. The Clear Choice At Home Pregnancy Test is another of Consumer Reports' top picks for reliable pregnancy tests. Its detection levels are similar to First Response, at about 6.5 mIU/ml. It also offers results in as early as one minute, and the test only requires one step. To perform the test, urinate in the provided collection cup. The cup itself has the pregnancy indicator on the outside of it. The positive result may show up in as early as one minute, but you will need to wait a full five minutes before reading a negative result. The cup also has an indicator to tell you the test has worked. The Fact Plus Pregnancy Stick allows you to test as early as four days before your expected period, although the manufacturer indicates accuracy will be much higher if you wait until the first day of your missed period. If you are testing before your expected period, Fact Plus recommends using first of the morning urine. If you are testing on the first day of your missed period and beyond, you can use urine from any time of day. The test is 53 percent accurate when testing four days before a missed period. It is 74 percent three days before expected period. Accuracy is 84 percent when testing two days before expected period. The test is 87 percent at one day before expected period. The test is 99 percent accurate on the first day of a missed period. Fact plus uses a simple plus sign to indicate pregnancy and a minus sign if you are not pregnant. 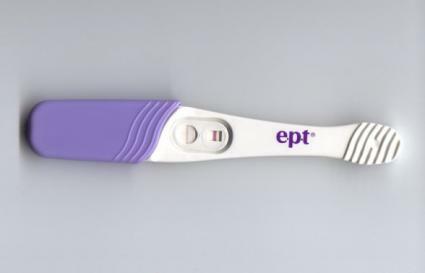 The Equate Pregnancy Test is Wal-Mart's store brand. It is an extremely affordable pregnancy test. The manufacturer says the test is 99 percent accurate five days after a missed period. Read the test after three minutes. The test will indicate you are pregnant if there is a plus sign in the indicator window. A negative sign means you are not pregnant. Clear Blue offers an array of pregnancy tests. The manufacturer states the tests can be taken as early as four days before the expected start date of your period. However, earliest testing is less accurate. Accuracy will improve if you wait until the first day of your missed period. Clear Blue suggests you use the first urine of the day. Read results after three minutes. The Clear Blue Advanced Pregnancy Test with Weeks Estimator tests whether you are pregnant. It also indicates how far along your pregnancy is. The display is digital, telling you are pregnant and how far along you are in words, so it's very easy to read. An hourglass symbol will flash during testing to let you know the test is working. The test estimates weeks by determining how many weeks it has been since ovulation. If the indicator says 1-2, that means your doctor will date your pregnancy at three to four weeks. If the indicator reads 2-3, the doctor will likely date your pregnancy at four to five weeks. If the indicator says 3+, the doctor will date your pregnancy at five weeks or beyond. The Clear Blue Digital Pregnancy Test makes it nearly impossible to misread your results. After testing, it will show the words "pregnant" or "not pregnant" in the results window. During testing, an hourglass will flash to show the test is functioning properly. The Clear Blue Plus Pregnancy Test is designed for ease of use. It has a larger collection tip than other tests, as well as a curved design. The collection tip turns pink while it is absorbing urine to assure you that you've hit your target. The test window shows a plus sign for pregnant and a minus sign for not pregnant. The e.p.t. (error-proof test) Pregnancy Test comes in two forms. Both can be used as early as four days before your anticipated period. Accuracy increases if you test the first day of your missed period and beyond. Read the results in three minutes. The test comes in two types: regular and digital. The regular e.p.t. test has a plus for pregnant and a minus for not pregnant, while the digital test will display the words "pregnant" or "not pregnant." When using a home pregnancy test, consider the following tips. While some brands of pregnancy tests say you can use urine from any time of the day, first in the morning urine has the highest concentrations of hCG, so results will be more accurate in the morning. Before testing, use a wipe to clean your vaginal area, wiping front to back. Some bacteria found in the vaginal area can cause a false result. Urinate a little before placing the test strip in your urine stream to further clean the area. Hold the absorbent tip pointed down in the urine stream with the indicator window facing downward. Never point the tip up towards your urine stream. Replace the cap over the absorbent tip and place the test on the counter with the indicator window facing up to read your test. If you test before your period is supposed to begin, your results are less likely to be accurate. Do not assume you are not pregnant. Instead, test again in a few days. A positive result should show up five days after your missed period. Taking an at-home pregnancy test can tell you whether you are pregnant so you can begin getting the care you need early in your pregnancy. If you test positive, contact your doctor so he or she can monitor and advise you on having a healthy pregnancy.